Make a bold romantic statement at your next event with this fabulous and eye-catching bright heart and uplift your marketing campaign with the warm and feel-good ambiance that a heart brings. 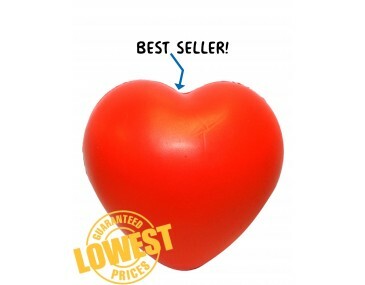 Hearts talk to the mind and the emotions and will make an impact with your clients and potential clients.Brand your company logo onto the heart and give these fun promotional items away as freebies at expos, shows, parties and other fun occasions. They are great for fashion houses and jewellery companies. They will also make a meaningful statement in the health, medical and hospital sectors for promoting healthy eating and a healthy lifestyle to prevent heart related problems. Our heart is a stress toy, making it even more meaningful. It offers a three-dimensional shape in a smooth finish. It can be squeezed and squashed to release tension and frustration and it will retain its shape. Stress toys are fabulous for use in environments where stress builds up, like the work place, when you cannot get away easily. Keep one close on your desk or in a drawer or handbag. They also make fun office ornaments to show off. Talk to our artists about branding. Additional print colours can be done via pad printing. For each additional spot colour please refer to the table below. Alternatively you can print your stress balls with a full colour digital transfer print finish. This will enable to have a gorgeous photo quality finish on your stress ball. Please refer to the table below as well for pricing for this option.